These Thanksgiving activities for kids are the perfect way to learn about Thanksgiving and practice learning activities at the same time. 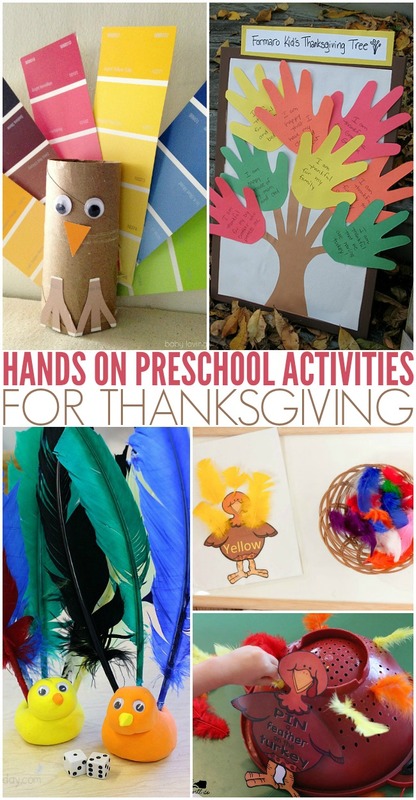 Some of my favorite October and November activities for preschool are fall activities and Thanksgiving activities. One of the best ways to teach children is through preschool themes. Since Thanksgiving is a holiday, it makes it a perfect theme for children to explore more about since they are seeing it and hearing about it all around! These thanksgiving activities and turkey activities are perfect for encouraging children to practice math, colors, the alphabet, literacy skills, fine motor skills and so much more. We especially love that they are hands-on Thanksgiving activities so children are learning with their senses! Whether you need activities for a Thanksgiving lesson plan, a Thanksgiving theme, or just to keep your preschooler entertained, these turkey activities and Thanksgiving activities for kids should do the trick! This Turkey Color & Number Match is an inviting way to help children practice learning their colors and is a simple Thanksgiving math activity at the same time. Dice games are always a hit with preschoolers and a great way to incorporate a math center for Thanksgiving. This Fine Motor Turkey Math is perfect for that! Do your kids like memory games as much as mine do? This Turkey Memory Game looks SO much fun to not only play but make too! Turkeys are typically round but that doesn’t mean they HAVE to be. This Shape Turkey is a fantastic way to adapt and show children how to explore shapes! This Bubble Wrap Turkey is an inexpensive and extremely creative way to paint turkeys as a Thanksgiving art activity. The final result looks textured and super colorful! It is exciting to be inventive while doing arts and crafts. 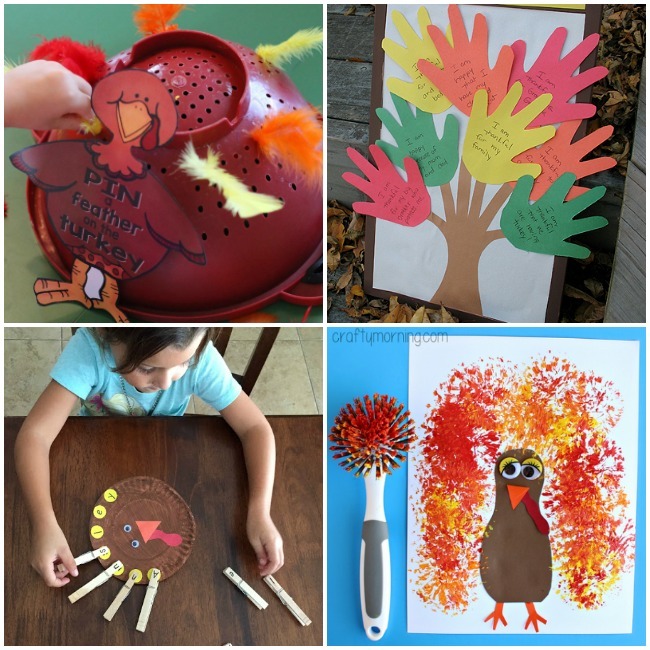 This Dish Brush Turkey Thanksgiving art activity is a perfect example! Who knew a dish brush could create such beautiful art! My kids love going into the paint section at the store and snagging paint chips. Sometimes they just sit there but not very often. Crafting with them is SO MUCH FUN. How adorable is this Paint Chip Turkey?? Handprint crafts always hold a special place in my heart. It’s hard to think that our children’s hands will never be as small as they are right now. This Thankful Tree is cute but also so sentimental and a perfect gratefulness activity! It would be perfect to go along with these books about gratitude and thankfulness. Not only can kids help create a fun turkey but this Feather Letter Turkey will also help children practice their ABCs! Help kids practice learning the letters and order of their name with this inviting Turkey Feather Name Recognition activity. It is also a perfect fine motor activity for kids. This Sight Word Turkey is a great way for older children to practice sight words. There are so many ways to use turkey feathers as learning activities. These turkey games are perfect for working on literacy and math skills for kids! Kinetic Sand is a fantastic Thanksgiving sensory activity on its own, but it makes it even more exciting when you add in a Thanksgiving theme like these Kinetic Sand Turkeys. This Color Mixing Pumpkin is a great mess free activity or a great fall sensory activity for little ones who want to avoid touching paint! Just grab a cardboard box for this inviting turkey feather fine motor activity that is perfect for little fingers. A great fine motor Thanksgiving activity for toddlers up to preschoolers is this Fine Motor Turkey! Plus, it’s an awesome use for a kitchen colander. This bottle cap Thanksgiving activity for preschoolers is such a clever way to recycle something we all have around. Use this Alphabet Turkey Match while teaching your little ones about reusing! Holding little pieces of pasta is great for helping strengthen fine motor skills for children. How fun is this Feed The Turkey? This Learn To Button Turkey is another absolutely fun fine motor skill strengthening activity that is great for on the go, a preschool center and more! It will also help children learn the self-help skill of buttoning! We hope you found something from our Thanksgiving activities for kids to inspire you and your little learners!